the Spanish abstract artist Pablo Picasso is sensitive to the social problems, reflecting a view on them in his work. One of his most famous works is "Guernica". In this picture reflected the worldview of the artist, expressed his vision of the world and the attitude to what is happening around him. Picture of Pablo Picasso's "Guernica" was a Manifesto against cruelty and violence. In the symbolism of pieces of encrypted history of Europe during the civil war and reflects the suffering of the world. The reason for the creation of the painting was the bombing by the Nazis of the Spanish town. "Guernica" Picasso contains archetypal symbols and images. They reflect the spirit of modernity. One of the most important masterpieces of the twentieth century, "Guernica" Picasso, created by the author in a fit of creative madness. He was so struck by the incident that created the canvas with incredible energy, fascinating and frightening, as the events that occurred in the Basque town on 26 April 1937. The bombing of fascist aviation destroyed the city by 70% and has killed over 1,500 people. Picasso worked on the painting almost continuously and finished it in a month. Many of his friends from time to time observed the work and left their comments. For the first time the finished result was presented at the world exhibition. 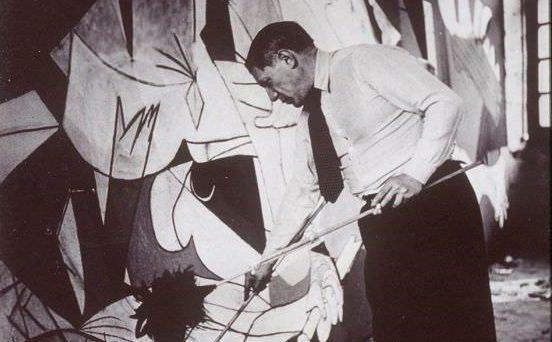 One of the most valuable photo "Guernica" Picasso – pictures made by the companion of the artist. They told the world the stages of work on the painting. "Guernica" painted in oil and is a canvas-a mural size 3.5 m tall and 7.8 m wide. Initially it was planned to make the picture colour, but it lost its oppressive atmosphere. Monochrome color solutions due to the desire of the author to portray the dead city, immersed in darkness. Many critics have noted the similarity of the image with the newspaper clippings of that time and call it “propaganda”. Painting by Pablo Picasso "Guernica" depicts scenes of suffering, violence, chaos, hopelessness, powerlessness and death. The people and animals depicted in the painting, maimed and broken, their eyes full of horror, and the mouths are disclosed in a silent cry. Building on the image of the destroyed or on fire. 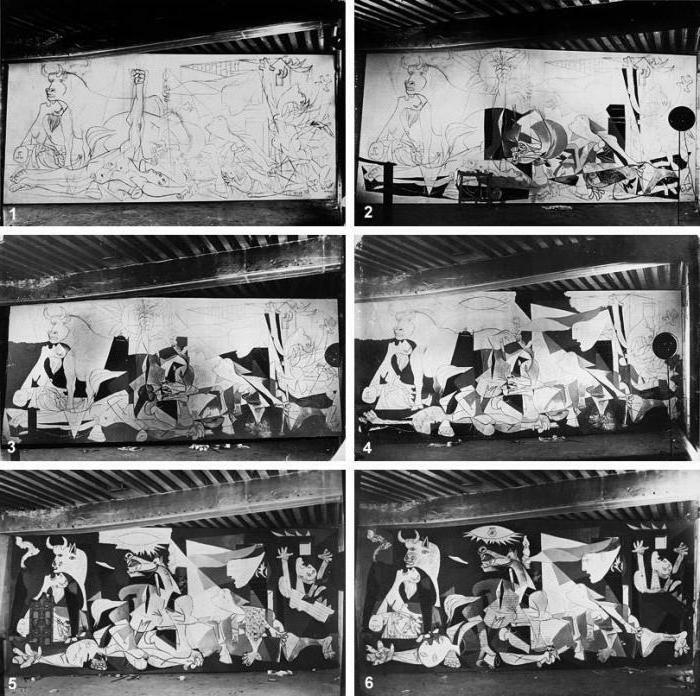 "Guernica" can be called graphic panels. Eyewitnesses claim that Picasso worked like a man possessed, which resulted in the style of the painting. The line crossing from the smooth, fuzzy and rounded, as if the flames, to the sharp and clear as broken glass and fragments of shells. The main task of the graphic element was a reflection of such emotions as fear, terror, anger and despair. Drawing Picasso's thoroughly accurate. Avoiding detail, it highlights only the important symbols and allegories. 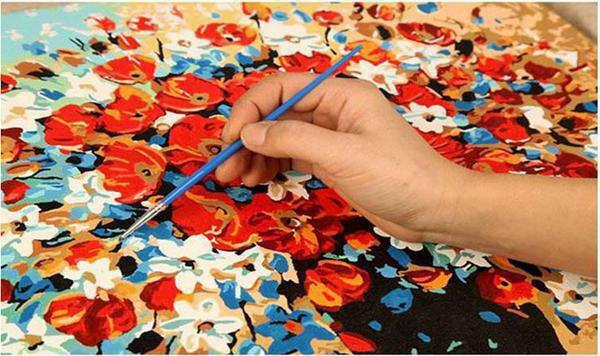 In the creation pattern used means of artistic expression and stylistic techniques borrowed from cubism and surrealism. To enhance the expression of black and white images, the artist used an overlay of colors, the intersection of the lines, played with shadows and shades of gray. the location of the objects, the canvas resembles a triptych-a painting which consists of three independent parts, United into one. If you visually divide "Guernica" into three parts, each of them can actually exist separately, while retaining its composition and meaning. All the events enclosed in this room. In the upper left corner of the painting depicts a bull. Under him is a woman, she is mourning her dead child. 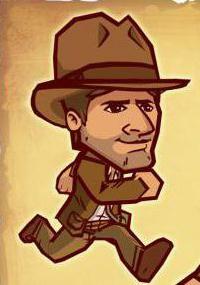 To the right of the bull, behind a little, flutters a bird, like the dove. In the center of the composition is the horse. Her posture and look as if it beats in agony and is about to drop dead. Many people say that her nose and wide open mouth form something like a human skull. At the feet of the horse in an unnatural pose is a soldier in the mirror. In one of them he holds the flower and the piece of the sword. Over the horse's head lamp or a lamp in the form of bull's-eye. Right through the open window into the room swam face on ancient mask. In the hand it's holding a burning candle and looks with horror at what is happening. Just below – woman in rags is moving to the center, her gaze directed upwards. If the paintings might sound, we would hear the shrill cry of a bull, horse and a woman with a child. It represent their languages in the form of sharp daggers. on the Right the artist has depicted the man who is in despair raised his hands to the sky. Around him fire, he will not get out. 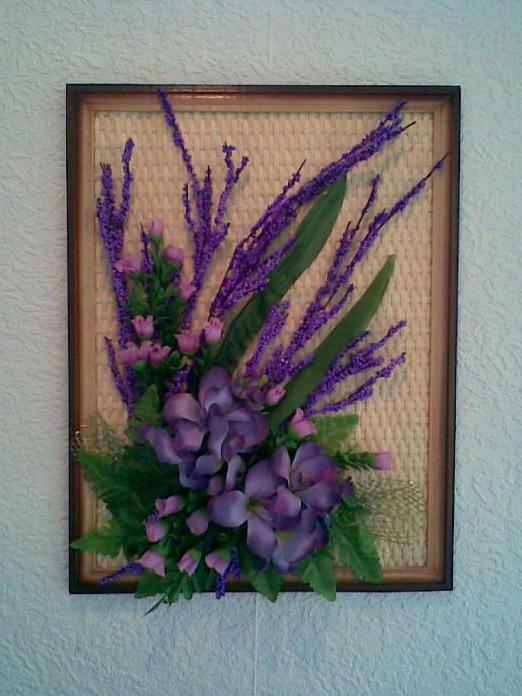 A black wall with a door completes the right-hand edge of the picture. "Guernica" Picasso speaks the language of symbols. It is full of riddles and parables, and each image has a particular meaning. The main colors which made the painting – black, grey and white. They can accordingly be understood to mean death ashes and a burial shroud. Key figures in the painting are the bull and the horse. According to the most common view was that the bull represents the callousness and indifference through which you can even have such things as war and fascism. Some believe that he, by contrast, represents the triumph of Spain, and the horse-her suffering. The artist himself claimed that the bull is a symbol of cruelty, and a horse – the people. Later, he said that the two animals represent the victim. Bull also refers to the image of the Minotaur as a symbol of destructive animal beginning. lamp in the shape of the eye is not in vain is the semantic center of the painting. It is, on the one hand, means a force that cannot be withstood, and the other lights up the space around the light of hope. No wonder the despair of the figure in the painting throws back her head, looking up with empty eyes and reached out their hands to heaven. convulsing pigeon obviously represents war. The bird also froze, outstretched wings, raised his head up and opened its beak in the Creek. On the palms of the dead soldier can see the stigmata. Picasso was not religious. That symbol he wanted to show suffering without apparent reason. Like Christ, people sometimes have to suffer because someone decided for them that it should be. So suffered by the Spanish people at the behest of the Nazis. Woman with a candle – an image of a man watching from the side. Her eyes Express a silent plea to stop the violence. "Guernica" has always caused controversy and mixed reviews. Someone called it the last masterpiece of Picasso, someone, on the contrary, did not consider it has artistic value, called the only anti-fascist proclamation. During the first exhibition, the film was not produced on the audience the desired impression. In this "suffered" of the canvas, they beheld the semblance of a political Manifesto and the tragedy of one small town not understanding the idea of the universal protest against the violence. At the beginning of the Second world war, Picasso was the Gestapo came. On the table they saw a postcard with a reproduction of the "Guernica". On the question of whether he did it, Picasso said, “you did..." you never know what might turn out for the artist this unheard of insolence, if not the German sculptor Henry Brecker, who helped to solve this problem, favoring the artists living at that time in France. 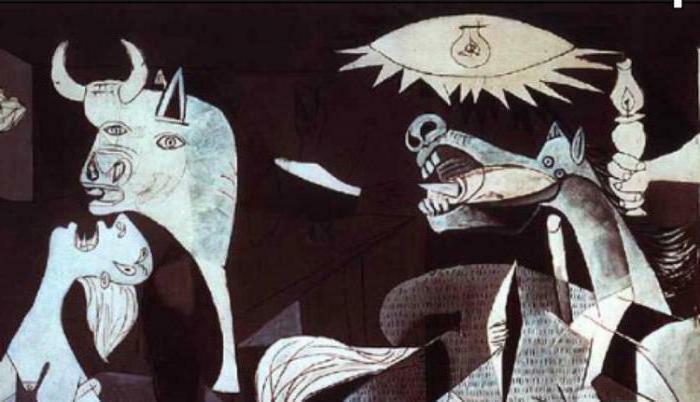 first Exhibited June 4, 1937, "Guernica" according to Picasso, were worthy to be in the Madrid Museum Prado. There it was exhibited from 1981-1992, and then was moved to the Museum of Hagia Sophia, where he is to this day. 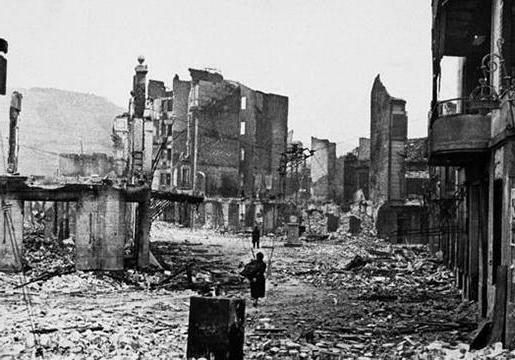 As a monument of despair and destruction, "Guernica" by the force of the impact carries the creative mission. Like depicted a woman with a candle in hand, she urges people to look inward and find there the light. Depicting the chaos and pain, the painting is a call to lay down arms. Thus, the main masterpiece of Picasso is in the broad sense of the Manifesto in the name of peace and humanity.